We love all those movies and TV shows with sheriffs in them. Usually with the small towns where some major crime happens? Then in steps the weathered sheriff who's seen some bad stuff. He's got a dark past and is super skilled, like an ex-soldier, or a detective from a big city. Then the sheriff takes on the serial killers, speeding criminals, aliens, shady companies with portals to other realities, and/or zombies. So yeah. We're totally fans of the underdog trying to keep his town safe. The best part? It works every time. The sheriff and his little team of misfits always prevails. So we totally get why you want to dress up like a sheriff (we do too). Although, we've been told that impersonating a police officer is a crime, so we can't actually advise that you try to enforce the law in one of these sheriff shirts. But you can wear it! Wear it and let everyone know that you're not a real sheriff, merely a sheriff enthusiast (or maybe one of those sheriffs above from a movie or TV series). And if you're going to go as a sheriff, you might as well use our Sheriff Shirt. 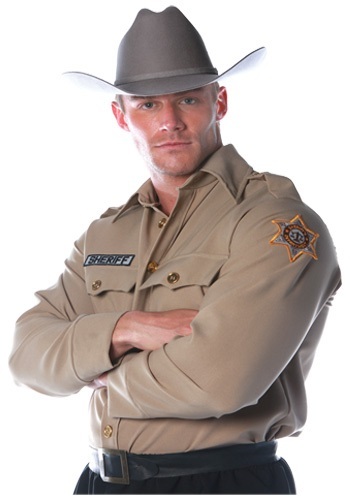 It's a long-sleeved tan button-up shirt, with "Sheriff" and a badge printed on the shoulder. There's even some serious looking pocket flaps (not actual pockets we're afraid). This shirt will make you look like the real thing! But you may want to warn your friends that you're not in any way required to take on any baddies that roll in.